We had three kites from previous beach trips. One breezy day over the boys' Spring Break, we took them down to the large pasture. One was missing a piece. Reid got his stuck in a tree when a breeze jerked it out of his hand. But Cort? Well, Cort had a grand time. Behold the joy of Spring! 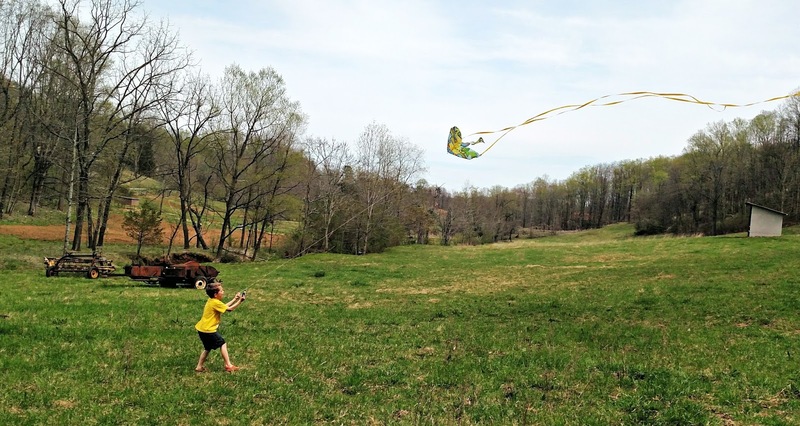 Readers, when did you last fly a kite? It's been years! We bought one on Martha's Vineyard and flew it out over the field and in the yard of the house we were renting. It got away from us and flew out over a neighborhood behind the house - never did find it. Yes! Yes! This is such a fun experience and we've had lots of windy days for great success around here too! Cort did a really good job! Love the photos. When my wife and I lived on Emerald Isle, off the coast of N.C. in 1985, I had two kites. One was a three dimensional Sopwith Camel, and one was a three dimensional Fokker Dr.1 triplane. They really looked like the real deal down there on the beach. I didn't get to fly them much myself as they attracted kids like bees to honey. Later, after we moved here, my wife used to take my son and daughter to the High School football field to fly kites, but I never went because I was working. I'm sure your boys loved that kite flying. We are at the beach now enjoying the sunshine. Good to see you! 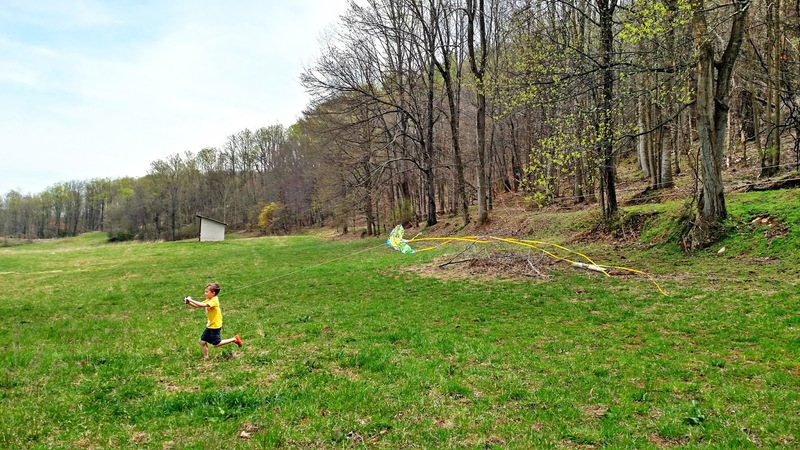 These are great shots of a boy and his kite!! Our grandkids love to go to the park and fly kites, too. I'm always wanting to buy new and bigger ones. I went to a Kite fest recently, will post some good ones coming up. They had a place to assemble your own that was fun also. It was a few years ago for me. I flew them as a kid and helped my own kids fly them. Always fun! There is something joyful about that kite flying and your son looking up at it. :-) I remember only one time trying to fly a kite as a kid--I think I need to try again. I was never good at it, sadly. Hi Lisa, I lost touch with you over time but saw your comment on Out On The Prairie's blog and want to wish you a Happy Mother's Day. I was never successful flying a kite! But now, it's about time to say HAPPY MOTHER'S DAY TO YOU, LISA!! I hope you had a lovely Sunday with your 3 boys, your husband & family. I just stop by to say hello to you, Lisa. I hope everything is well with you all. It's been forever! I like to watch the kids fly kites though- they do all the leg work and I get to watch the fun! Actually about two month ago with my brother! It's been years since I flew a kite. In the city it's just so hard to find a spot.